Here at Enviro Reefs Paddle & Surf, we help make the most of your surfing or stand up paddleboarding experiences. 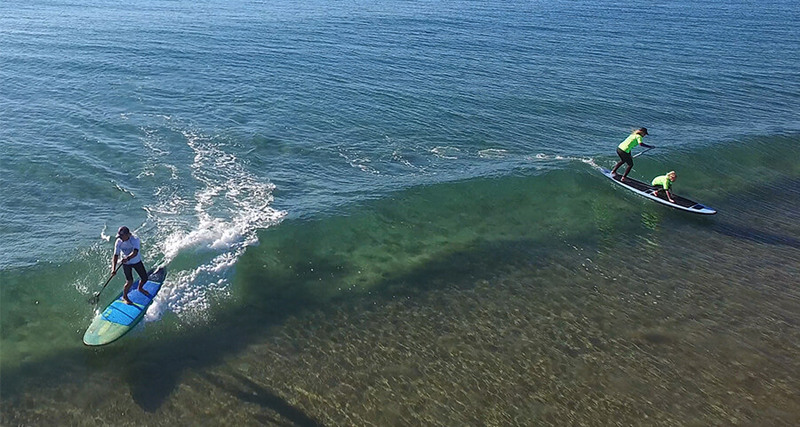 Furthermore, we are situated at the heart of Queensland’s tropical coastline, and we are a locally owned and operated surf school and SUP school that offers inspirational surfing lessons and SUP lessons for every skill level. 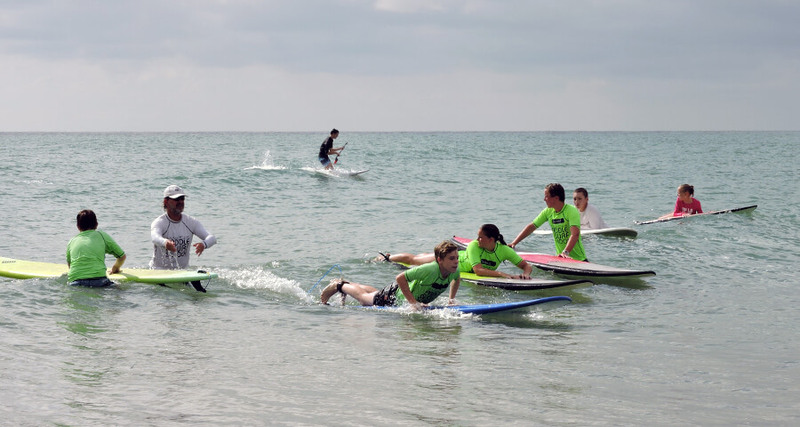 From novice through to the most experienced surfer or paddler looking to improve their skills, we will provide you with an unforgettable experience. In addition, we supply all equipment including boards, and even wetsuits for the cooler months. The Bundaberg and Bargara regions are the perfect place to learn to surf or SUP during your holiday in Queensland, Australia. Bundaberg is far enough north to have warm weather all year round, but without the fear of stingers or crocodiles that can be found in the more northern locations. Progress up to six times faster than other Surf School or SUP School! Try us and find out why. 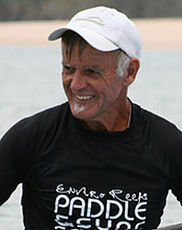 At Enviro Reefs Paddle and Surf School in Bargara we really care about your progression as a paddler and surfer. As a result, we are different to other surf and SUP schools that only aim for maximum numbers, we limit all our lessons to eight students per instructor to guarantee you get the most out of your lesson. Therefore you are going to have more fun with us! 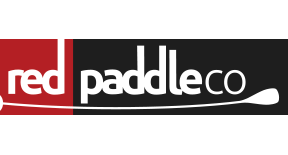 Learn about the board and paddle whilst picking up some basic paddling skills. You will master the essentials and practice paddling across flat water. Daren has been surfing for as long as he can remember. Daren really knows his stuff. His specialty is to provide support and training for people with disabilities on water and on land. Daren is a fully accedited coach for standup paddleboarding and surfing. 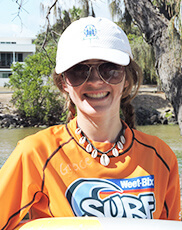 As a fully accredited Surf and SUP coach Grace loves to teach people a sport that has so much to offer both physically and mentally. Known as Kermit, grace is full of energy and passion for the ocean and looks forward to helping you get the most out of Surfing and Stand Up Paddle Boarding. Jenny’s (also known as Kooks or the surfing reverend) favourite board is a 7ft 6 shortboard but also rides a 9ft 2 longboard, and SUP. 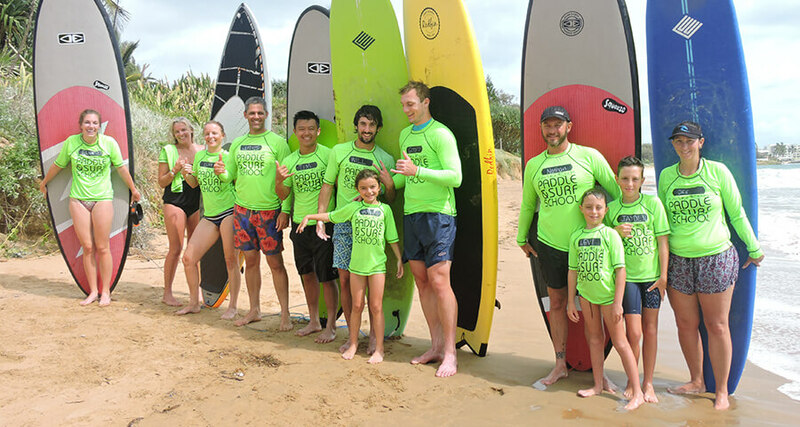 Level 1 Surfing Australia Coaching accreditation, Surf rescue Certificate, First Aid Certificate, Working with Children’s Blue card, Safe Working With Children Certificate. Megan has been a part of the beach ever since she was a little grommet. 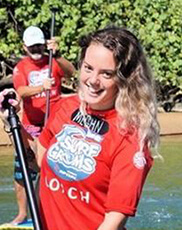 She is an accredited Surf and Stand up paddle board coach and loves coaching all ages and nationalities, most important she loves putting a smile on everyone’s dial. Great on the longboard and loves to be on a wave no matter the size, as long as she is in the ocean she is a happy lady. 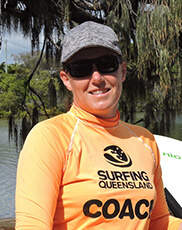 Full accredited Surf and Stand Up Paddleboard coach, she looks forward to sharing her stoke with you as you learn to Surf or SUP. Daren has been surfing for as long as he can remember. Daren really knows his stuff. His specialty is to provide support and training for people with disabilities on water and on land. 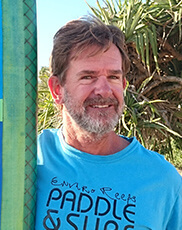 Daren is a fully accedited coach for standup paddleboarding and surfing. Jenny’s (also known as Kooks or the surfing reverend) favourite board is a 7ft 6 shortboard but also rides a 9ft 2 longboard, and SUP. 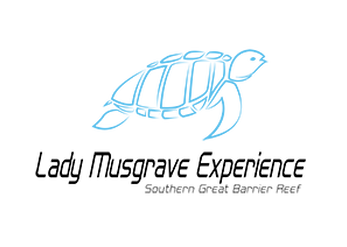 Level 1 Surfing Australia Coaching accreditation, Surf rescue Certificate, First Aid Certificate, Working with Children’s Blue card, Safe Working With Children Certificate.gs. ​At the southern end of the beach, the estuary of Coach-house Creek drains a tidal mangrove community. A variety of wildlife can be seen in this area. Bert Hinkler’s historic glider flights happened here and at the age of nineteen, he attained the height of 30 feet in his first solo effort. The Kanaka Wall is a well-preserved piece of history. Kanakas were Melanesians from the South Pacific Islands who were indentured to work in Queensland cane fields during the period from 1879 to 1904. Part of their work was to clear volcanic rocks to allow cultivation of fields. The rocks were packed together to form fences and these could be seen all over the district. 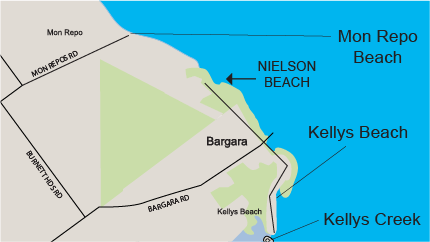 Kelly’s Beach is situated to the south of Bargara township itself, offering a open water surf beach along its length with a tidal lagoon at its southern end and a tidal rock pool at the north end that is popular with families to sit and swim in. Being a patrolled beach during the summer months and close proximity to shopping, the golf course, caravan park and waterfront walks, this beach is often the choice of many for their recreational activities. 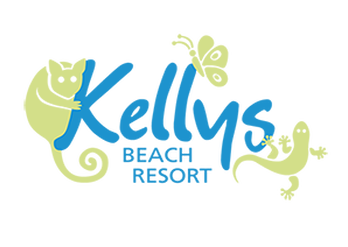 Featuring a nice sheltered BBQ and shower/toilet block, plenty of car parking and another adjacent beach (Archies) Kelly’s is definitely a beach to experience and spend some time at. 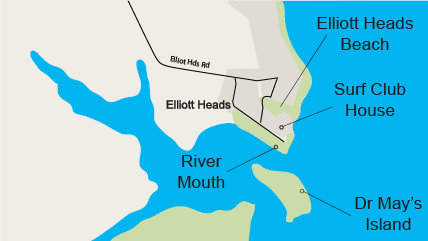 Elliott Heads is situated at the Elliot River mouth and offers both surf and calm water swimming. 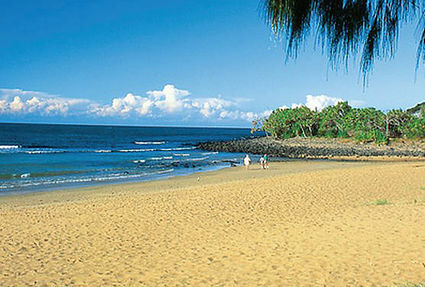 It is also a popular spot for wind and kite surfing while the fishing is good from the shore or on nearby reefs. Sandstone cliffs form an interesting headland and the rocky foreshore is fun to explore. A shady, landscaped caravan park is adjacent to the beach, as are a number of pleasant picnic spots with barbecue and toilet facilities. Surf lifesavers patrol the designated swimming areas during the summer season. This is a great family holiday destination. Elliott Heads along with Riverview are the southernmost of the local beaches situated at the mouth of the Elliott River, and are surrounded by rural cane and small crop farms. 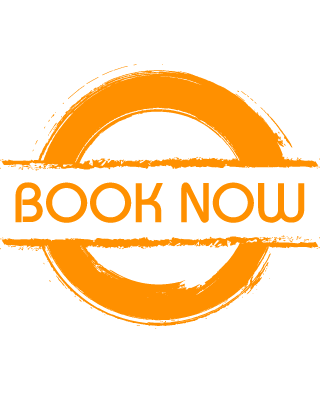 Unit and cabin accommodation is available. Only 18 kilometers from the city, access is via Elliott Heads Road. ​At the southern end of the beach, the estuary of Coachhouse Creek drains a tidal mangrove community. A variety of wildlife can be seen in this area. Bert Hinkler’s historic glider flights happened here and at the age of nineteen, he attained the height of 30 feet in his first solo effort. The Kanaka Wall is a well-preserved piece of history. Kanakas were Melanesians from the South Pacific Islands who were indentured to work in Queensland canefields during the period from 1879 to 1904. Part of their work was to clear volcanic rocks to allow cultivation of fields. The rocks were packed together to form fences and these could be seen all over the district. 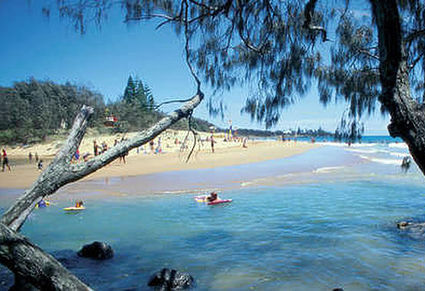 Our surf school and SUP school locations are some of the most beautiful beaches in Queensland. Our area is located perfectly in Queensland, Australia. 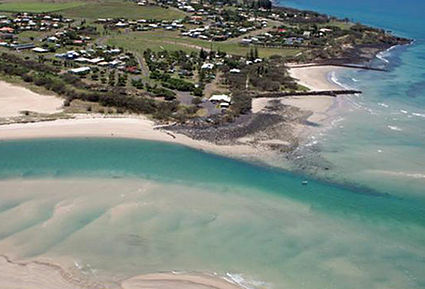 All locations are only a short 20 minute drive from the centre of Bundaberg, or even closer from Bargara. Our area is located only five hours north of the Gold Coast, and even closer to Brisbane, Sunshine Coast, Agnes Water 1770 and Rockhampton. We are located in a prime location on the east coast – north enough to be warm all year round, but south enough to avoid hazards such as stingers and crocodiles. So we hope to see you come and learn to surf or experience Stand Up Paddleboarding in one of our beautiful locations soon!